Chrysanthemum is widely used in Chinese cuisine. When I make tea I always add a small handful of dried one (the species C. morifolium ) in it. Besides of giving it a lovely aroma, chrysanthemum supposes to be able to subside the "heatingness" of body specially during the hot weather. Last week the weather in Barcelona was unbelievably hot and dry, pretty much like roasting myself in a hot oven. I felt a bit sick, but I knew that an extra vitamin C and chrysanthemum shall be doing me good. Then I was thinking of make this version of lemon bars. I've tasted some other lemon bars whose top pudding is buttery (and soft), which is divine, but this time of the year I really want something much lighter. This version of mine is tart, refreshing and (slightly) firm (to touch). You can re-adjust the amount of sugar, the flour and baking time to suit your own liking. For the bottom layer, you can use your favorite shortbread crust's recipe. I've added 1 Tbp of ground fresh ginger into it too. After the crust's dough is made, roll/ press a thin layer in the (lined with baking paper and leave two sides overhang) pan. Bake for about 15 minutes in a pre-heat oven of 350C. Take out the pan and set aside while you're preparing the pudding. Leave the oven on but lower the temp to 325C. Mix the eggs and the regular white sugar for a few minutes. Then add lemon juice, lemon zest, powder sugar and the flour. Stir well. In the very last minutes, stir in milk and the flower petals. Immediately pour the mixture into the pan. Bake the pie in a medium hot oven (about 325C) for approx. 25 minutes or until it sets. I prefer mine slight firmer, so I turn off the oven and let it sit for another 5 minutes. Remove the pie from the oven and let it completely cools off inside the pan. Carefully lift up the baking paper's overhang and remove the pie from the pan. Now you can cut it to your preferred size. 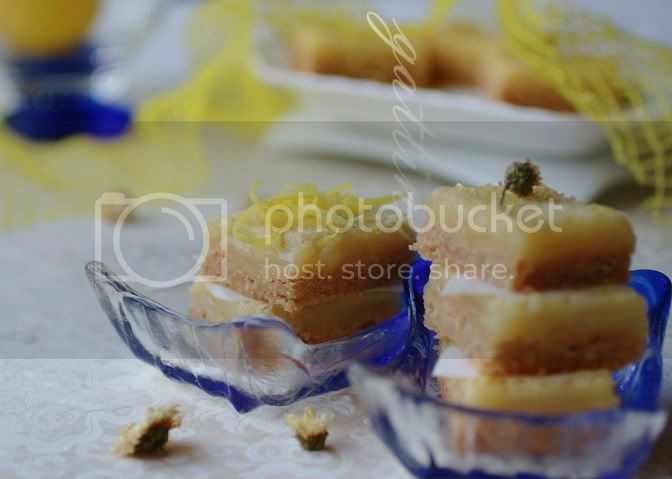 Feel free to decorate the lemon bars with more dried flowers and lemon zest. Sprinkle more powder sugar if you like it sweeter. What a delightful combination. Those bars must taste heavenly! gattina, this is brilliant! i always love crysanthemum tea but never thought of incorporating that into my bakes, thanks so much for the inspiration!! 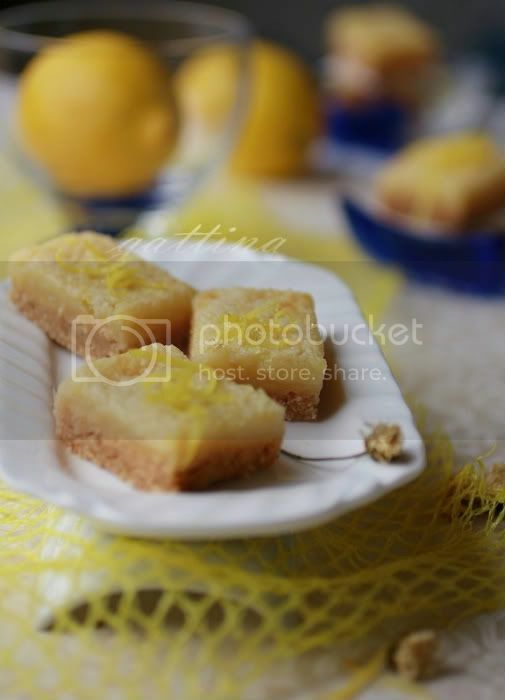 What a wonderful twist on lemon bars, Gattina! These are beautiful - and I love it that you added ginger to the base. Yum! Sound like a great combo, anyway I loves lemon. Yours lemon bar looks delicious.